No one likes feeling like there's no privacy. Ensure your yard stays exclusive by installing a tall fence or planting some dense bushes or tall trees. By providing your backyard with privacy, you don't have to worry about the whole neighborhood knowing exactly what your barbequing for dinner or how many people you have over your house. 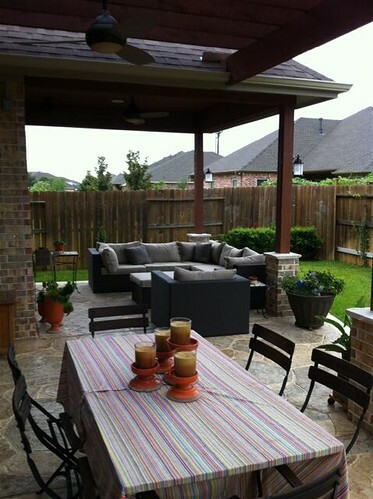 There are various DIY crafts that are easy and affordable to make your backyard look fantastic. Whether you add a few outdoor lights around trees (or just leave them there from Christmas!) or make some great waterproof chair cushions, you can create things to improve your yard without breaking the bank. Depending on your level of experience and how much time you have, check out Pinterest for some good DIY ideas on decorating your backyard. Whether you have a patio leading into your backyard or have a firepit surrounded by chairs, it's important to have a special area where guests can enjoy themselves and relax. Patios are relatively easy to fix up and often only require a new paint job or fixing a few loose screws. You may also want to invest in a few tables with umbrellas and chairs so that your guests have somewhere to sit while they eat or just relax while holding a conversation. When it comes down to it, you don't have to spend a lot of money to make your backyard stand out. By adding a few finishing touches and spending some time cleaning up, mowing the grass, and ensuring that your guests are comfortable, your yard can be the perfect destination for your guests this summer!